The winding path of creativity I travel. Note: The following recipe was created for juicer machine pulp but I think it would be a great recipe on its own with one or two substitutions that are suggested in the recipe – so if you don’t have a juicer – read on. 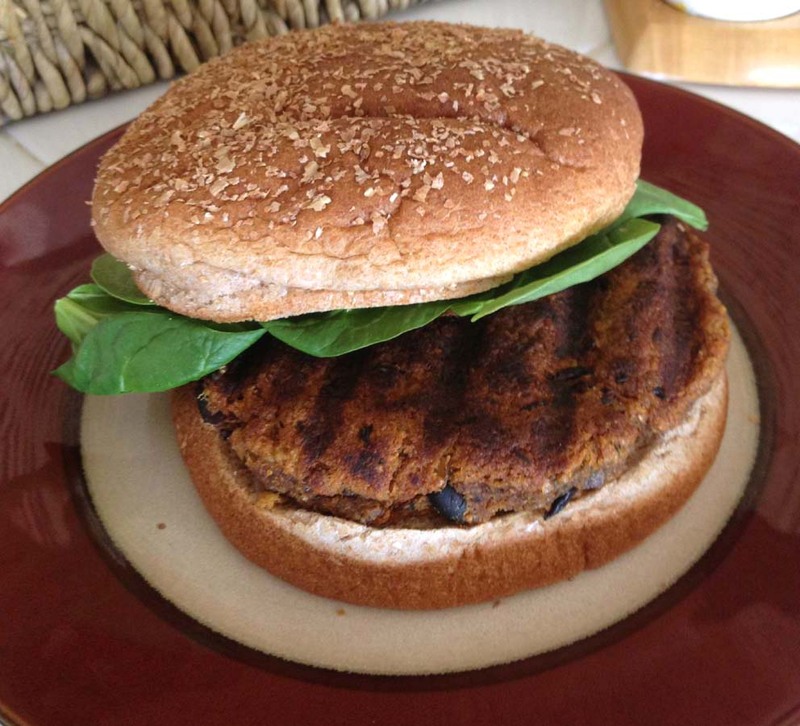 My veggie burger, juicer pulp journey has taken some interesting turns since last I posted. I’ve learned a lot about the basics of cooking which, if you’ve read my other posts on this subject, you’re already aware, that I’ve never been a big fan of cooking or even eating for that matter. On March 1st I celebrated my one year anniversary of giving up all animal based products in my diet. I have to admit that over the holidays I did cheat a bit and have some cookies here and there that I’m sure were made with dairy products but that was about it. I even gave up one of my favorite appetizers, crackers and brie cheese. I watched everyone else eating it and I was surprisingly satisfied with corn chips with salsa and a few other vegan dishes. So, to update those who are just joining us, I’d asked for a Jack LaLane juicer for Christmas thinking it would give me a really easy way to get the nutrients I needed without cooking. Well, this was true to a point but juicer pulp was just not something I’d considered. I’m not sure what I thought would happen to the remainder of the fruits and vegetables after the juice was extracted but it turns out that there’s quite a bit of pulp leftover. My problem was, what I would do with it, as throwing it away or even composting was out of the question. As of my last post I’d found a somewhat clumsy way of separating the vegetable and fruit pulps, when I discovered, by accident, that veggie pulp tasted pretty horrendous on oatmeal. Well, I’ve backtracked quite a bit on that idea. I’m no longer separating anything since the new veggie burger recipe I’ve finally perfected (very subjectively speaking) tastes great with either fruit, vegetable or mixed pulp. I still use mostly veggie pulp in my humus spread recipe but you can toss just about anything (within the context of juicing, of course) into the veggie burger mix. My first few veggie burger attempts turned out not so well. I won’t repeat what my husband said when he tried one. But through a lot of experimentation and many failures, I think I’ve finally come up with something that’s not too bad! I actually like them but there are no guarantees to anyone with a finely tuned culinary palate. 1 16oz can black beans – well-drained and about the same volume of fruit &/or veggie juicer pulp. In lieu of juicer pulp, the same volume of lentils or blended chick peas would work. You can also experiment with spinach and broccoli or other veggies and fruits chopped finely in a food processor. This portion of the recipe is a wild card. Have fun with it! Drain the black beans well and pour into a large mixing bowl. Use a potato masher to turn the beans to a paste-like consistency but still with some whole or partially intact beans. Next add the juicer pulp and use a rubber scraper to mix the beans and pulp thoroughly. Now add the olive oil and remainder of ingredients. Mix all the ingredients thoroughly. Begin adding the bread crumbs or flour until you can make a ball with the batter in your hands and no liquid seeps through your fingers. Make a patty with the mixture and flatten consistently (be sure it isn’t thicker in the center). At this point I grill the patties on my George Foreman Grill for about ten minutes but you can fry them in a pan with olive oil. The latter method is obviously higher in fat if that’s a consideration. It’s very important that the burgers are grilled thoroughly or the centers will be very mushy and unappetising. I leave them on until the grill lines are really dark brown but not burned. I usually make a batch or two and refrigerate them. I throw them in the microwave at work then add spinach, ketchup, yellow mustard and a little tahini. Yum! If any real cooks out there have suggestions for improvement, I welcome them! Bon Appetit! I’m still working with the “pile of sticks” but, as usual, I’ve been distracted by another project. I was replacing all the old brochures in the hotel office with new ones and I ended up with a pile of colorful, glossy paper to throw in the recycling bin. Looking at the pile, that same old nagging thought kicked in…”These must be useful for something. I can’t just throw them away”. The gears start slowly churning and, of course, whatever I’m doing at the time gets pushed to the side while I ponder this newest problem. I’ve made notecards with r ecycled paper before, but this paper was of a heavier stock. I finally found my trusty paper shredder, pushed some of the brochures through it and they were transformed into 1/4″ wide strips. Some of the brochures had old sepia toned photos and colorful landscapes. When shredded, the original image is unrecognizable and you’re left with pure colors and tones. I used a glue stick to adhere the paper to some blank notecards and the strips created nice contrasting vertical stripes. After they dried, I used a mixture of white glue and water to add a translucent layer of recycled tissue paper on top that gives the cards a matte finish and beautiful texture. I printed out four different ornate letter “O”s on some recycled paper and mounted them on brown craft paper that came as padding in a package I received. I glued the mounted letter to the card. When I finish the rest of them to the other note cards I’ll have a set of four completely unique note cards. Here’s a photo of some letter “T” cards I made with the sepia toned photos in the brochures. Click on the photo to see the listing in my shop. When I finish the “O” cards I’ll post those as well. Last Summer I spent quite a few afternoons pruning shrubs in the garden that had grown completely out of control during the worst of my illness. I didn’t use an electric pruner because they’re loud and leave shrubbery looking “shaved” and unnatural. Instead, I got out my hand pruning shears and loper for larger branches. The process probably took ten times longer than it should have (and it’s not officially finished). I found it very therapeutic, although I won’t spend too much time pondering why I find wielding sharp objects and chopping branches relaxing. As I chopped away, I began looking at the branches as I threw them in the compost bin and noticing the beautiful shapes some of them made. As with many things, I thought they were too beautiful to throw away, so I threw them into a broken plastic planter under the stairs, sure I’d find something useful to do with them. Every time I walked up the stairs to my apartment, I glanced at the pile hoping an idea would materialize. A few days ago, one finally did. I had just washed out an empty glass salsa jar and voila – the idea was born! I love homey feel of the rustic style and I think this piece would fit right in. I already had a big spool of natural colored hemp twine that I’d used to string beads, so I used it to wrap the branches together. I found some large wooden beads that weren’t much use for jewelry making (the hole was too large) so I strung them on with the twine. It took me some time to figure out the best way to achieve the results I wanted, so I had to rewrap many of the branches before I got it right. Hopefully, the next time I make a similar tea light holder, it’ll go a little faster since I know what I’m doing now (yeah right). Here is the finished product. I’m pretty happy with how it came out. Next time I’d like to try a taller jar so I’ll be able to use some of the more uniquely shaped branches. Click the photo below to see the listing in my Catalina Inspired Etsy shop. Hello and welcome to “The Process 1, 2, 3”! I’ve created this blog to share my creative process and the “stuff” that eventually hatches from it. My personal creative process has been accurately described as “all over the place”. I attended the Maryland Institute, College of Art (MICA ) in Baltimore, MD from 1991 – 1996 where I earned a Bachelor of Fine Arts in Painting. Although I was formally trained in classical oil painting and it remains one of my great loves to this day, I have experimented with a huge variety of media and continue to do so. I grew up in Central New Jersey but have lived on Catalina Island off the southern coast of California for the last 8 years. Catalina is a beautiful place to live and is endlessly inspiring. I feel very lucky to be here. Two years ago I was diagnosed with ME/Chronic Fatigue syndrome and Fibromyalgia. Though I still struggle with the disability these diseases have imposed upon my life, I remain hopeful that I’ll be well again. For anyone who is interested in this topic, I’ve been writing a blog called Fibromyalgia??? for the last year and a half that goes into much more detail about this aspect of my life. I would like to keep that topic within that venue but I apologize if it rears its ugly head from time to time. Environmental issues are very important to me and I try to use repurposed, recycled or sustainable materials in my artwork and craftwork when ever I can. I currently have a shop on Etsy called Catalina Inspired where I showcase some of my creations. In the future, I’ll be posting about the process behind many of my works and sometimes before they are listed in my shop. I’ll also be writing about living a simple life and leaving a small footprint on the environment. I welcome feedback and comments and I hope you will stop by again soon!